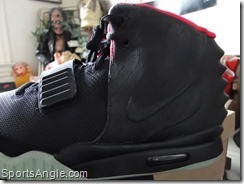 Ã¢â‚¬Å“Are you going to keep them or sell them?Ã¢â‚¬Â Rob, the manager at House of Hoops on 34th Street, asked me back in June as I purchased my pair of Nike Air Yeezy IIs. I hadnÃ¢â‚¬â„¢t really thought about it. To that point, IÃ¢â‚¬â„¢d sold one pair of sneakers ever. He paused for a second while I considered his logic. He was right Ã¢â‚¬â€œ I do love sneakers, and it would be great to own a pair of Yeezys as the centerpiece of my collection. Perhaps IÃ¢â‚¬â„¢d hold on to them, wear them for special occasions, a little instant credibility if IÃ¢â‚¬â„¢m in an NBA locker room or something. The funny part was that I actually had no intention of getting the Yeezys, which wasnÃ¢â‚¬â„¢t for lack of interest. I like Kanye West, I collect sneakers and the shoe grew on me as I saw more pictures. But the hype was out of control, and at 32, IÃ¢â‚¬â„¢m too damn old to be sleeping outside, risking getting mugged over a pair of sneakers. I also wasnÃ¢â‚¬â„¢t about to pay an outrageous amount on the secondary market. The only effort I put in was to fill out a form on Foot LockerÃ¢â‚¬â„¢s web site for a random drawing for the right to purchase a pair. Then I forgot all about it. A few days later, I got an e-mail from Foot Locker: Out of fifty thousand people who had signed up for a chance to buy the Yeezys, I was one of 300 whose name was drawn. 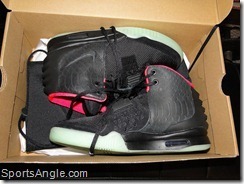 I had until seven the next day to get to House of Hoops to get my pair. It felt like I had found one of Willy WonkaÃ¢â‚¬â„¢s golden tickets. IÃ¢â‚¬â„¢ve acquired some pretty coveted sneakers over time Ã¢â‚¬â€œ I have a pair of LeBron IIs that was limited to 500 pairs Ã¢â‚¬â€œ but never had it seemed like such a hustle as with the Yeezys. Rob was right: As I left the store, there were about a half-dozen shady characters staking out the entrance, hoping to shock and awe easy marks with a fistful of cash en route to doubling or tripling their money on eBay. I avoided eye contact and walked by quickly, trying not to tip my hand. I honestly felt like I was transporting contraband. Once safely in my car, I did a quick eBay search on my phone. Given that the Yeezys wouldnÃ¢â‚¬â„¢t go on sale at Nike.com until later that evening, there werenÃ¢â‚¬â„¢t a ton of them on the market, so the ones I saw were going for ridiculous prices, over $3,000 in some cases. It was then I grew convinced I should probably sell them. The hitch came when I got back to my fiancÃƒÂ©eÃ¢â‚¬â„¢s parentsÃ¢â‚¬â„¢ house, opened the box and saw the Yeezys in person for the first time. The Yeezys were a fever dream, an outrage to convention. They looked a lot better in my hands than in online pictures, with an amalgamation of premium leather, ballistic mesh and serpentine scales carved from nubuck on top of a glow-in-the-dark sole. The sneaker had a reptilian-shaped Achilles, hieroglyphics and mini-obelisks for lace tips. 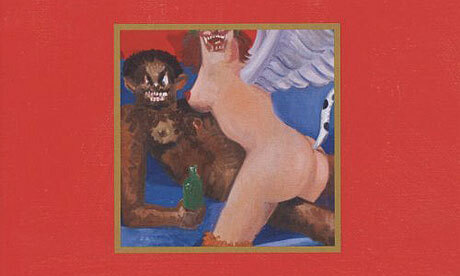 They were akin to something the twisted caricature of Kanye from his banned album cover would wear. IÃ¢â‚¬â„¢d never seen sneakers like the Yeezys, and if I sold them, I knew IÃ¢â‚¬â„¢d never have them again. As a longtime sneaker collector, that was a tough pill to swallow. Torn between having my version of TurtleÃ¢â‚¬â„¢s Fukijamas from Entourage or cashing them in like a lottery ticket, I asked my lawyer fiancÃƒÂ©e what I should do, hoping she would make it easy for me and tell me to sell them or sheÃ¢â‚¬â„¢d sue me for stupidity. Obviously, sheÃ¢â‚¬â„¢s wonderful. But that didnÃ¢â‚¬â„¢t make my decision any easier. When it came down to it, I pretty much knew the whole time what I would end up doing. That night — aided by a coworker/friend who kept telling me I would have been nuts not to sell them — I posted the Yeezys on eBay. Before I went to sleep, they were already going for more than $1,000. 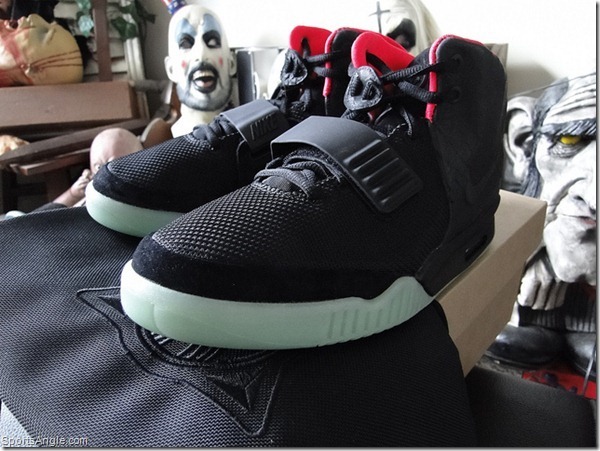 They sold three days later for $2,300 to some guy in Canada who was ecstatic to get them. 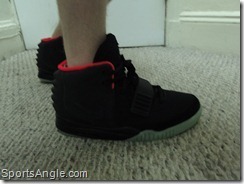 I put them on for the first and only time late that night, took some pictures as a memento and sent the Yeezys off the next morning. Minus eBay fees and what I paid for them, I cleared about $1,700. In certain ways, becoming a Ã¢â‚¬Å“resellerÃ¢â‚¬Â Ã¢â‚¬â€œ a dreaded term among sneakerheads Ã¢â‚¬â€œ didnÃ¢â‚¬â„¢t agree with me. There are plenty of people who buy sneakers with the express purpose to sell them for a profit, driving the prices sky high for people who actually want to wear them. That obviously wasnÃ¢â‚¬â„¢t my modus operandi, but given the premium I received, and that I turned down much lower offers from people who claimed they couldnÃ¢â‚¬â„¢t afford to pay more, I canÃ¢â‚¬â„¢t say I didnÃ¢â‚¬â„¢t become part of the problem. And yet, I have to confess the whole thing was kind of a thrill. Watching the dollars pile up bid by bid was a rush akin to day trading a stock. I still have a level of disdain for the unabashed reseller, but I at least see the appeal now; it combines the fiscal allure of a quick buck combined with the illicit nature of selling something everyone wants. Besides that, though, the best part of the Yeezy experience Ã¢â‚¬â€œ and why I could sell them and not look back Ã¢â‚¬â€œ is what theyÃ¢â‚¬â„¢ve come to symbolize for me. My fiancÃƒÂ©e and I are getting married in about five weeks, so we donÃ¢â‚¬â„¢t exactly have a ton of disposable income right now. And on top of that, we moved to a new city three weeks ago and needed all new furniture. A few years ago, there would have been absolutely no way in hell IÃ¢â‚¬â„¢d have even considered selling the Yeezys. But at 33, I could either keep a pair of sneakers IÃ¢â‚¬â„¢d wear like five times a year Ã¢â‚¬â€œ or I could use the money they were apparently worth to buy a new couch, kitchen table and loveseat. This isnÃ¢â‚¬â„¢t to say IÃ¢â‚¬â„¢ve stopped collecting sneakers, but every time I look around our apartment, I can see exactly how far IÃ¢â‚¬â„¢ve come, and I like where IÃ¢â‚¬â„¢m at. IÃ¢â‚¬â„¢m not going to lieÃ¢â‚¬Â¦ last month, when I saw Kanye wear them in concert and rap in Ã¢â‚¬Å“New God FlowÃ¢â‚¬Â that the Yeezy jumped over the Jumpman, I couldnÃ¢â‚¬â„¢t help but smile and shake my head ruefully for just a second about the kicks that got away. But though I was glad to have been able to walk a mile in Kanye’s shoes, there’s little doubt in my mind that I’m doing just fine wearing my own.